Brownies topped with Heath Milk Chocolate Toffee Bits. 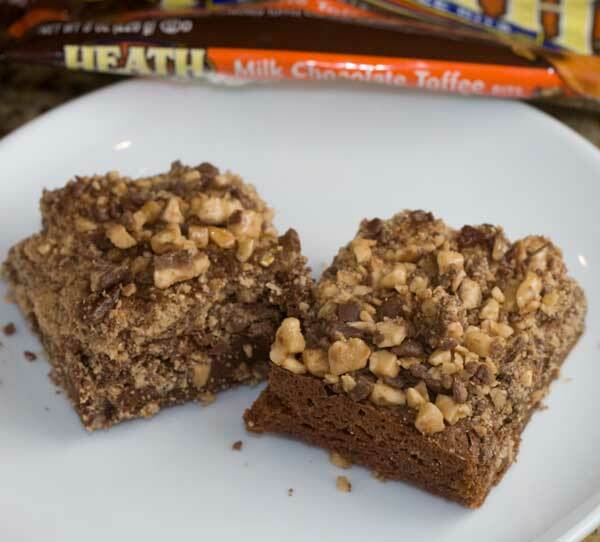 This one is straight from the Hershey's Test Kitchen. Preheat the oven to 350°F. Line an 8 inch metal baking pan with foil and spray the bottom with cooking spray. Melt the butter and chocolate in medium saucepan over low heat, stirring occasionally. Stir in sugar. Add eggs, one at a time, beating after each addition. Stir in vanilla. Combine flour, baking powder and salt; add to chocolate mixture, stirring until well blended. Spread batter in prepared pan. Bake for 20 minutes or until brownie begins to pull away from sides of pan. Remove from oven; sprinkle with toffee bits. Cover tightly with foil. Cool completely in pan on wire rack. Remove foil and cut into squares.